Following widespread concerns raised by some of Europe’s riders’ rights organizations, including Brussels based FEMA (the Federation of European Motorcyclists’ Associations), vehicle authorities in Europe will cooperate with motorcyclists’ organizations and conduct their own test program with different brands of semi-autonomous cars. 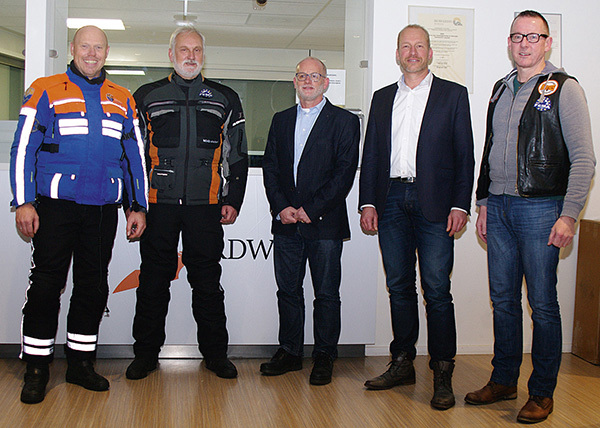 From left to right: Arjan Everink (KNMV), Dolf Willigers (FEMA), Anton van der Heijden (RDW), Jan Sybren Boersma (RDW) and Wim Taal (FEMA) – the RDW has agreed that testing with motorcycles should be part of the test protocol for European type approval of so-called autonomous cars and those with cars with Advanced Driver Assistance Systems, including systems such as Adaptive Cruise Control (ACC) and Lane Changing System (LCS). Field tests could start as early as 2017. Those concerns center around the extent to which the testing of fully and semi-autonomous systems had been calibrated to account for the presence of motorcycles. This is in response to lobbying of RDW – the Dutch Vehicle Authority that issued the European type approval for Tesla – by FEMA, the Motorcycle Action Group in the Netherlands, and the KNMV, the Royal Dutch motorcycle riders association. At a meeting with the RDW, at which the motorcyclists’ worries were discussed, it transpired that despite granting type approval, the RDW shared many of the concerns raised. As a result, the RDW proposes - in cooperation with the motorcyclists’ organizations - to conduct their own test program with different brands of cars with Advanced Driver Assistance Systems. RDW also believes, as do the riders, that testing with motorcycles should be part of the test protocol for European type approval.